Buy Fashionable Women Girls Ladies Hair Claw Jaw Clip Hairdressers Hairdressing Accessory Black Pack at Narvay.com.Hair Clips, Hair Clips Hairdressing Salon Hair Grip DIY Accessories Hairpins for Women, Girls and Hairdresser.Pieces Butterfly Clamps Non-slip Chic Styling Claw Hair Clips for Women and Girls. 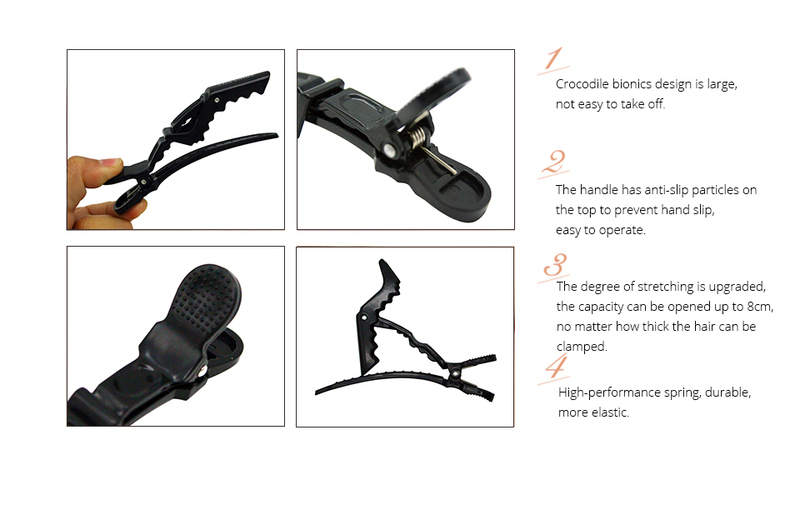 -The sectioning hairdressing clip features unique alligator tip, which can firmly clip hair with ease. 1. Please do not for purposes other than makeup. 2. Please do not put in direct sunlight or temperature is too high or too low. 3. Keep out of the reach of children. I ordered january 29, i came to order on march 29, the quality is normal, do not smell anything, i did not use the work, the seller himself extended the protection, wrote a message that i did not worry, the order came in time, it was possible not to extend the protection, but the fact that the seller does not care, is pleasant. The tweezers turned out fine. Good quality. Very professional to work in an aesthetic and make dyes. It took them a week to get to america. The clips are good, nice material. They are perfect to work and dye hair. They arrived in a week to the usa.